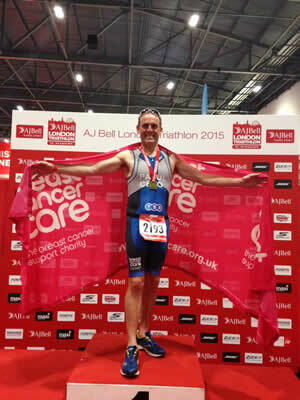 On Saturday 8 August 2015, 109 TSB Partners from across the UK took part in the London Triathlon, raising nearly £50,000 for 42 charities as they competed against the Bank's Chief Executive in his #BeatTheBoss challenge. TSB Partners were encouraged to take part in the event by TSB's Chief Executive, Paul Pester, who personally committed to sponsor all those who participate £50 to go to a charity of their choice, plus an extra £50 if they managed to beat his time. Paul completed the sprint distance triathlon in 1 hour 18 minutes 50 seconds. One Partner managed to #BeatTheBoss, while a further 11 managed to beat Paul in one of the three disciplines (swim, cycle, run), resulting in Paul providing an additional £600 to charity. 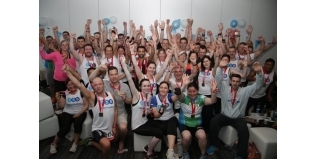 This means TSB Partners have now raised nearly £50,000 for their chosen charities as a result of the triathlon. To find out up-to-date information about the charities supported and how much has been raised, visit the TSB team's JustGiving page. Paul Pester, Chief Executive Officer of TSB Bank, says: “Saturday's London Triathlon was the culmination of many months of training for over 100 Partners right across TSB. The atmosphere on the day was fantastic and it was great to see so many friends and family out to support our TSB triathletes who put in a brilliant performance – especially those who #BeatTheBoss! Partners were free to support a charity of their choice, and Paul supported Breast Cancer Care, raising over £13,000 – exceeding his personal target of £10,000. As well as encouraging staff to take part in fundraising events like the London Triathlon, TSB also gives its Partners the freedom to pick their own Local Charity Partners based on the needs of their local community. Every single TSB branch and office site, supported by local customers, has got behind the programme following its launch at the start of the year and partnered with a local charity, club or society that serves their community. Nearly 500 charities are now benefiting from fundraising support from their local TSB, and the Bank recently increased its fundraising target for 2015 to £400,000. In addition to fundraising activity, TSB also encourages staff to spend a day when they would normally be working out in their community supporting a local good cause.